A friend's husband recently passed away and I made this card for her. Hope it brightens her day just a little bit. I'm also using one of the 10 tiny sentiment stamps from Quietfire Design. Anyway to see more details and descriptions, just click on card image. Enjoy. 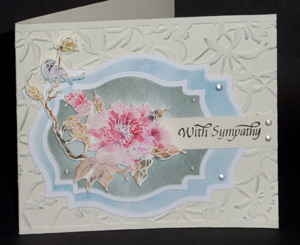 Very beautiful and soothing sympathy card, Yogi.